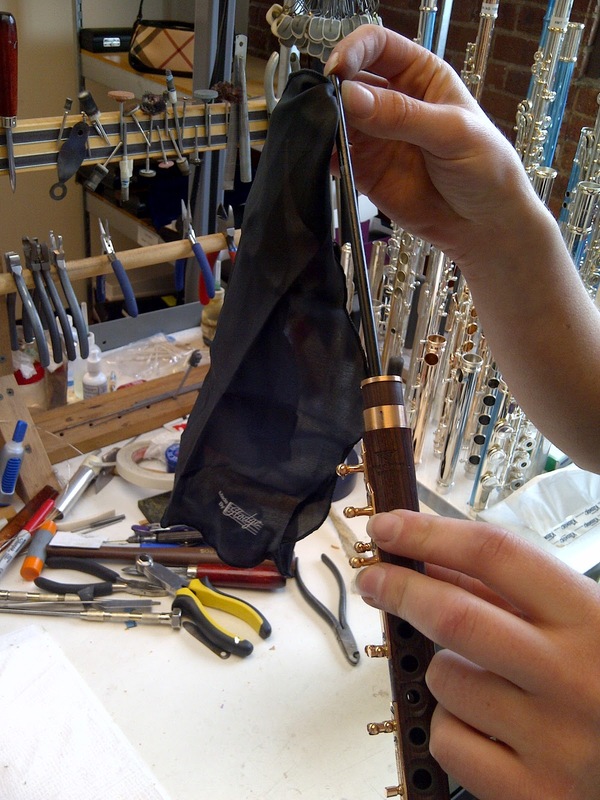 Repair technician Rachel Baker swabbing out a kingwood Custom piccolo. We all want the best for our flutes and know that the question of humidifying wooden ones in particular comes up quite often. Should you use a humidifier? Is it overkill? Can it cause more problems? Our wood technician assures us that the best way maintain a wooden flute is to play it regularly. If you play it for a while, leave it for several months (untouched), and then pick it up to play it, you will notice differences which may make playing the instrument difficult. However, if it is played consistently, the wood will be acclimated to patterns of being played, swabbed out, placed in the case, and then played again. However, one thing that did surprise us recently in a conversation we overheard was the idea that wooden instruments do not need to be humidified because there is enough moisture in the bore after playing. Hmm. Well, yes, there is certainly moisture in there after playing, but you do not want to leave it that way! With wooden instruments, you have to make sure that you thoroughly swab out the bore of the body and headjoint. Never leave moisture in your wooden instrument -- it could lead to all kinds of problems, including cracking. However, we don't want to forget about metal instruments when thinking about "standing waters." They are certainly not good for the inside of metal flutes, so proper swabbing is crucial there as well. And, make sure to never put anything in the flute bore and leave it there to absorb the moisture -- like those "fuzzy" looking accessories. If you use something like that inside the flute to absorb moisture and leave it in there, well, you'll only be left with something moist and fuzzy inside your flute with no place for the moisture to go! So, remember, swab out your flutes and piccolos thoroughly, take good care to keep them clean, check to make sure everything looks alright inside and out, and if you have any questions or concerns, don't let it wait -- contact your repair technician.